I am going to tell you a tale, this story like many others will begin and it will end. We all know the ending; it has been passed down to us from father to son since the beginning of time. A time when Icarus flew to the sun, and Artemis ran through the forest her silver stag by her side. Once upon a time there was a man, a prince to be exact, who’s name will one day be passed down through the generations. However when we are first introduced to this person he is still a boy, a kind soft-spoken lonely boy who lived far away in a kingdom that no one has ever heard of. This boy may be a prince, but is a constant disappointment to the king. The king spends his days complaining to his deaf and old advisers, who like to nod and agree, while dreaming of days when they were young. Yet this tale is not about them, but his son, who at the age of seven did not join the other boys to fight, but liked to play on his own in the mountains beyond the castle. This castle sat nestled on the sea front dominating the beach and all that occupied it. The boy was quite content with his own company and enjoyed the sound of silence only interrupted occasionally by the waves hitting the sand far below, and the smell of salt on the wind. Now the boy is older, but still quiet and shy, his father has commanded that he is sent away to make him into a man. The boy clings to his mother tears sliding down his face begging her to fight for him, not send him thousands of miles away where he knows he will never see his mountain again. The mother is only silent looking down her nose disapprovingly. The Queen never wanted children, and was unlucky that the potion given to her by the crone who lived on the beachfront, forgot to mix the remedy properly. But lets not forget that this tale is about her son, and the tragedies that brought his mother to this moment do not matter, you will not need them. On the other side of the world, the destination that our hero will spend the next decade of his life, is a place that everyone recognizes, so I wont insult your intelligence by giving it a name. Here the prince is loved; he is thirteen but is showered with praise and can do no wrong. 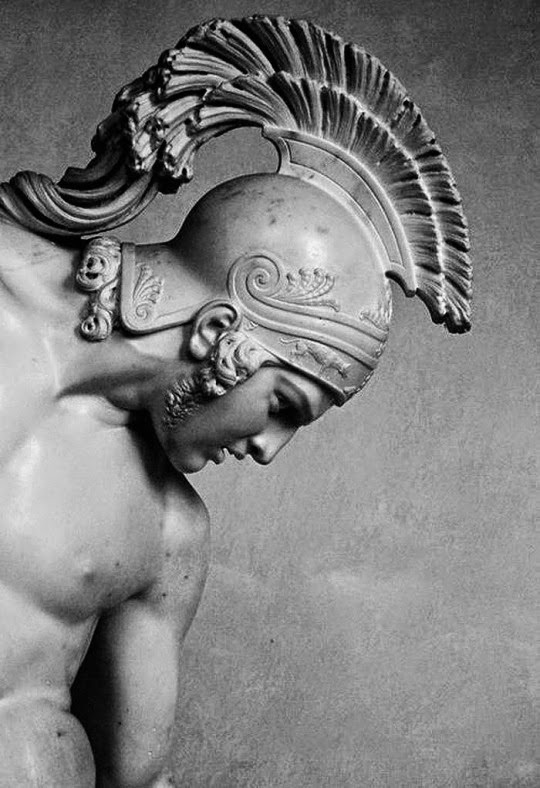 Achilles is ten when he first meets Patroclus, his father has taken him to the unknown Kingdom that holds the games that year, he sees the shy boy sitting next to the king clutching the wreath, now shiny, as the boy rubs his thumb nervously over the dark emerald leaves. This is the wreath he will win, as his pink heels lick the sandy track as he races the older boys to the finishing line. Achilles hopes that this small boy will place the wreath on his head, but the king snatches the leaves from the boys lap, and with an envy that Achilles has never seen in his own father’s eyes, the king places it on his head. Achilles is told countless of times that his father, Peleus, trapped a mermaid, who was known in this kingdom as the goddess of the sea, and married her. This mermaid known, as Thetis, was furious and tried in anyway to get out of the knot of marriage. She searched high and low for weeks, only to find that the solution was to have a son, an heir for the father to love and care for. Thetis agreed and on their marriage night a demi god was created. Thirteen years later Thetis could still be found on the shores of the beach luring unsuspecting sailors into an untimely watery grave. But this tale is not about her, although she craves the attention of others constantly, she is vain, just like her son. Her beauty was given to her little Achilles, who shone golden in the sunlight with blond hair and sparkling blue eyes; his heels pink and skin sun kissed and olive brown. This boy was truly blessed, which puts him in complete contrast to the shy boy who will be arriving any day. When Patroclus wobbles his way off the war ship a week later still trying to adjust to his land legs, Achilles’ father gruffly greets him and promptly pulls the boy back up the beach to the castle’s entrance. The father worries. The boy Patroclus, he thinks his name is, wont speak. He has tried everything from whipping to fighting, but the boy remains silent. The king has been paid a lot to teach this whelp the way of men, and he is uncomfortable with the boy’s shyness. The father sees this boy as the shadow of his son, dark where Achilles is golden. It is on one of these scorching hot days when Achilles finds himself once again alone with his fighting master. He knows what is coming, he has heard the sickening sound of the whip through the air to meet flesh at least twice this week, and feels pity; a feeling that at the age of thirteen Achilles has never felt. In a moment of friendship that will change the course of the oracles sight, Achilles goes to find Patroclus. Surprisingly, but not at all unexpected, as the Gods have their eyes on these two young boys, Achilles finds Patroclus curled in a fetal position in the corner of his room. Patroclus remembers Achilles, the golden winner that his father had looked at with an envy and pride that Patroclus had never experienced. However, he felt no resentment towards this older boy he now lived with, on the contrary he was as drawn to this golden creature as everybody else. Achilles knelt down next to Patroclus and stared at him with unflinching curiosity. Patroclus tried to return the intense gaze, but was, as expected the one to look away first. In an instant Achilles had grabbed Patroclus’ wrist and started dragging him to the throne room, he made no attempt to resist the will of this unwavering demi-god. Achilles made no effort to knock, but barged his way through the double throne room doors. His father sat on a raised platform at the head of the hall, and looked up from a sheet of parchment he had been intently reading, at the sound of the doors hammering open. “He is the one I have chosen,” his father looked to Patroclus, as if studding something unpleasant at the bottom of his shoe, or an artifact that seemed useless and simple. “I find him… interesting. He is to be my Therapon.” Companion. And that was that, the beginning of a friendship that would last eighteen years. They would never be parted. At first Patroclus was shy around Achilles, but as the weeks turned to months the two found each other’s company rewarding. Patroclus never minded losing the games that he would play against Achilles. Who could be upset when watching Achilles laughing delightedly, as they sprinted across the beach racing one another? As the years flew by Patroclus became happy, the nightmares left him, and Achilles voice lulled him to sleep, as they spoke about simple nothings in the quite darkness of their room. It wasn’t until the two had been studding with Chiron, for a few years that with the sticky juice of figs on their fingertips, and the taste strong on their tongues did their lips meet. Clumsy and frantic like plump bees crashing together, as though the time apart rushed in all at once. They fell back into the grass Achilles pinning Patroclus to the ground trying to taste as much as him as possible. Running hot kisses down the side of his neck like water never to dry. In this moment, their fate was sealed. If they had listened quietly they could have heard the sound of the three sisters of fate, pulling the golden string taught, and getting ready to cut through it. We all know how this story ends with the rage and grief that will destroy Prince Hector outside the walls of Troy. But this is not about endings, but the beginning. A beginning that changed the fates design, a friendship that re-stitched destiny. In the end, I am told, Achilles begged for the arrow, welcomed it even. Apollo, lying lazily on his back, helped the vain prince Paris shoot the killing blow, with an accuracy that only a God could hold. In the afterlife Achilles hid Patroclus in the fields of Elysium, so that no God could ever touch him again. Achilles will always remember the moment of their first kiss on that mountainside, hidden from the gazes of Thetis and Chiron. He will remember the shy boy who grew into a man, who followed him to Troy and stayed with him through all the agonies. And in the darkness of Hades, two shadowy hands stretch through the hopeless, heavy night, desperately reaching for one another. Their hands meet and light spills in, flood like, a hundred golden urns pouring out the sun.